Gitzo is a name every photographer is familiar with, as it's a trusted maker of all manner of camera accessories. Now, Gitzo has introduced an addition to its range: the Gitzo Century camera strap collection, describing it as "a premium modular system that complements the Gitzo Century camera bags range, the camera strap collection is the accessory of choice for the most discerning professional rangefinder & premium CSC and mirrorless camera users." Like most of Gitzo's products (as well as those of Manfrotto, its companion brand) this range was designed in Italy, emphasising its heritage by using Italian leather and an exclusive carbon-fibre look reminiscent of Gitzo's tripod legs. The range comprises interchangeable camera straps for a range of uses, designed to be quickly configured for different uses. Every product in the range features identical G-lock safety buckles to aid that versatility, and tested to make sure they can support a heavy full-frame camera and its lens. 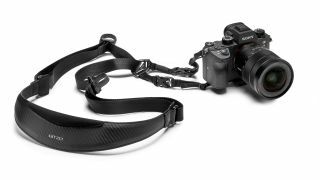 The Century sling strap has a cross-body design that holds the camera comfortably to the side of the photographer’s body, leaving users free to move around. It's compatible with all DSLR and mirrorless cameras with a standard 1/4″-20 tripod screw, and has a quick-release plate with rubber grip and short D profile. The RRP for the Century sling strap is £79.95. The Century neck strap features a soft, suede-like texture aimed to keep your neck comfortable throughout a full day of shooting. The neck strap is equipped with both a ring-type camera attachment system and a universal 10mm wide band attachment for standard camera loops. It holds most full-frame cameras, rangefinders, and CSC cameras. The Century neck strap's RRP is £99.95. The Century hand camera strap helps photographers to hold their camera steadily and comfortably while they shoot. This model is compatible with all DSLR and mirrorless cameras featuring a standard 1/4″-20 tripod screw. It has a quick-release plate with rubber grip and short D profile and enables photographers to attach their camera to a tripod with the Century hand strap in place. The RRP for the Century hand strap is £59.95. The Century wrist strap is billed as "an elegant solution for carrying mirrorless cameras". Users can choose between an anti-scratch ring-type camera attachment system and a universal 10mm wide-band attachment for standard camera loops. Its G-Lock buckle make it compatible with all the Gitzo straps. Designed to follow the shape of your wrist, it's designed to hold your mirrorless camera secure while allowing you to photograph. The RRP for the wrist strap is £44.95. For more information please see Gitzo's website.